Koalas are not currently on the endangered list, but that does not mean they are not at risk. Koalas were nearly extinct in the early 1900s due to hunters killing them for their fur. Currently, the number of koalas is decreasing and could be as low as 40,000. Some scientists estimate that the species could be extinct within the next 30 years. The koala's natural enemies include foxes, dingoes, lizards and snakes as well as pet dogs and cats. Dog attacks cause thousands of deaths to koalas each year in Australia. Baby koalas are susceptible to being killed by large birds such as owls and eagles. Koala skin is thin and easily punctured, so even a small bite wound can mean an almost certain death for a koala. Koalas are vulnerable to prey anytime they are walking on the ground. Koalas are prone to chlamydia, which, while usually not fatal in healthy animals, can cause death in already sick or injured koalas. Chlamydia causes blindness and pneumonia as well as urinary tract infections that can cause infertility. If they are unable to reproduce, the population of koalas will decline. Koalas are also prone to diseases such as cancer and leukemia. Increased stress from other environmental factors can make them more vulnerable to illnesses. Car accidents that kill koalas are all too common. Koalas are nocturnal and may not be hard to see at night. Arsonists who set forest fires were also responsible for killing many koalas in the early 1990s. Bush fires can clear out entire colonies of koala bears at once. 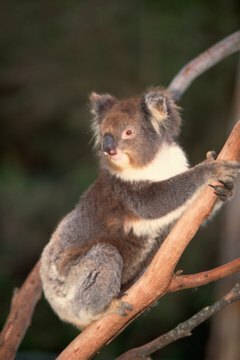 Eucalyptus trees contain a gas that may spread forest fires quickly, and koalas may not move quickly enough to escape them. The koalas bears' sole source of food and water is eucalyptus leaves. The eucalyptus trees in Australia are being destroyed because of deforestation due to construction of homes, factories and roads as well as the mining and forestry industries. In fact, about 80 percent of their natural habitat has been destroyed in the last 200 years. Climate changes, particularly the greenhouse gases caused by global warming, are also having an adverse effect on the growth of eucalyptus trees.